Bunches of rosy radishes have started to appear in the grocers over the past few weeks, and I finally succumbed and bought a couple last weekend. It was only in the last couple of years that I’ve developed a real love for baby radishes, and now I can’t seem to get enough of them. 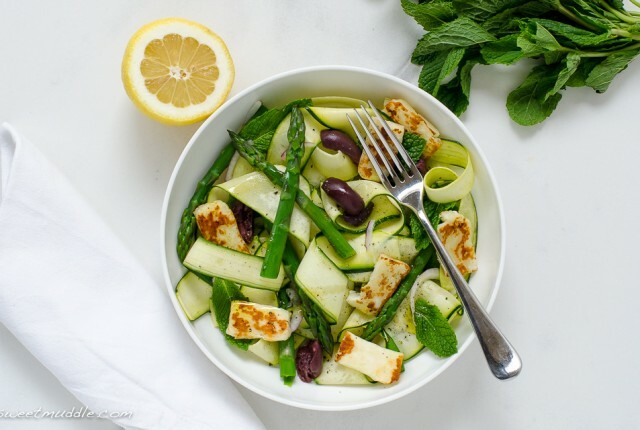 I love their peppery flavour, which becomes more intense during the summer and more subtle and sweet in the spring and winter. 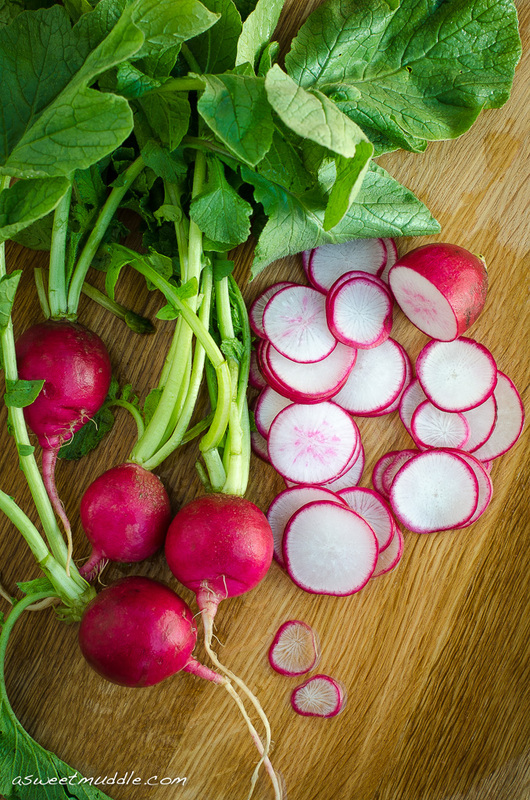 Radishes make a great snack between meals, and can be a nice change from carrot and celery sticks when served alongside a bowl of humus. They also make a wonderful pickle, which is exactly what I did with one of the bunches of baby radishes I bought last weekend. These quick pickles are delicious served on a cheese or charcuterie board, or tossed through a green salad. 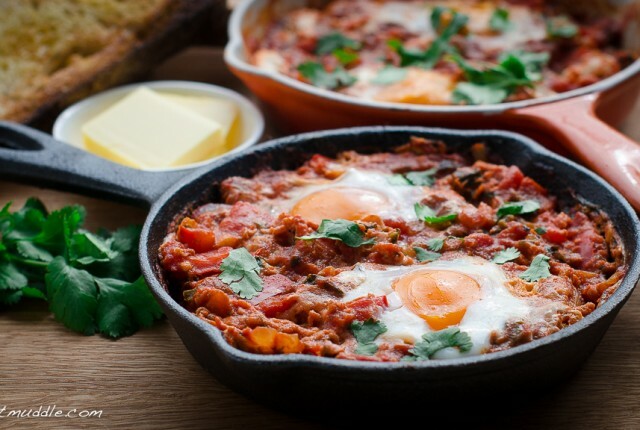 And if you’re feeling really adventurous, you could use them instead of gherkins on homemade burgers or sandwiches. 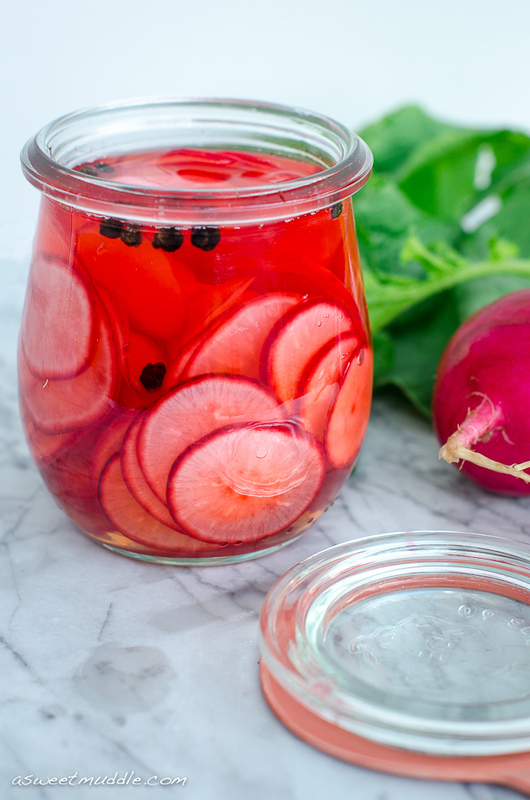 A simple recipe to make pickled radishes in next to no time. 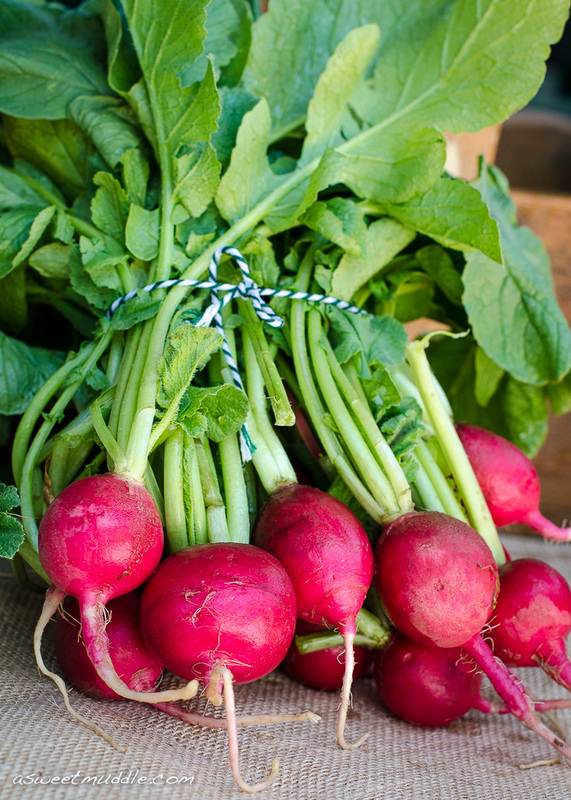 Slice the tops and bottoms off the radishes. 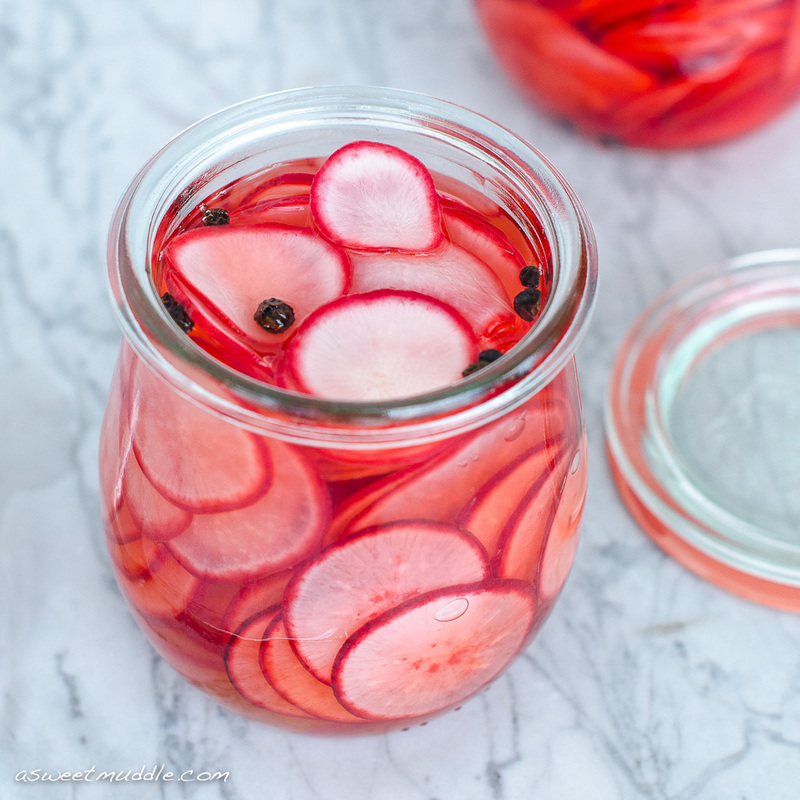 Using a mandolin (or sharp paring knife) cut the radishes into thin slices. 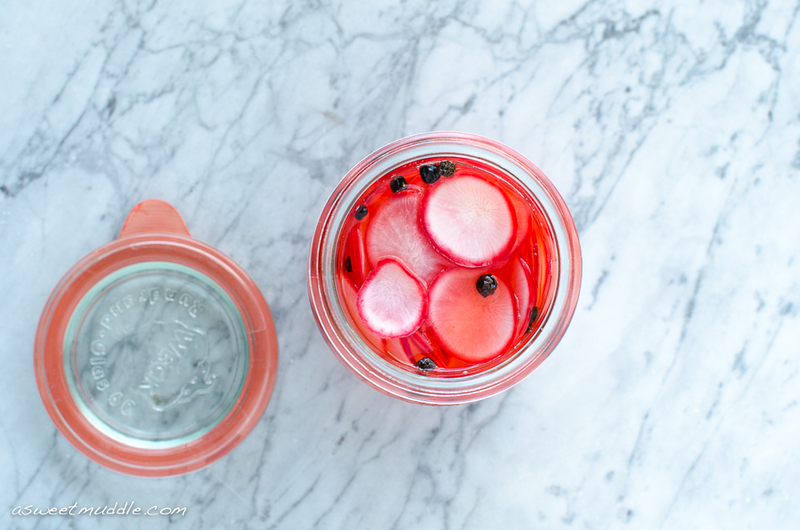 Pack the sliced radishes into a sterilised canning jar. Heat the vinegar, salt and sugar in a small saucepan over a high heat until it begins to boil. 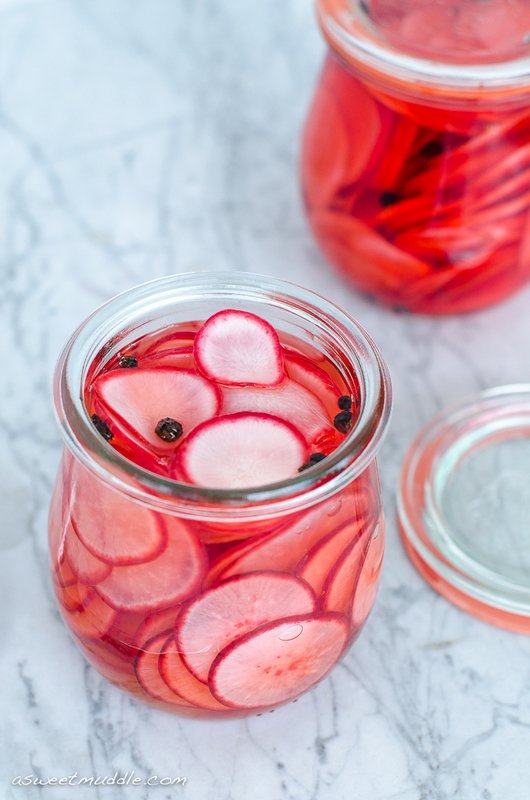 Remove the saucepan from the heat and pour the liquid over the radishes. And add the peppercorns (if desired). 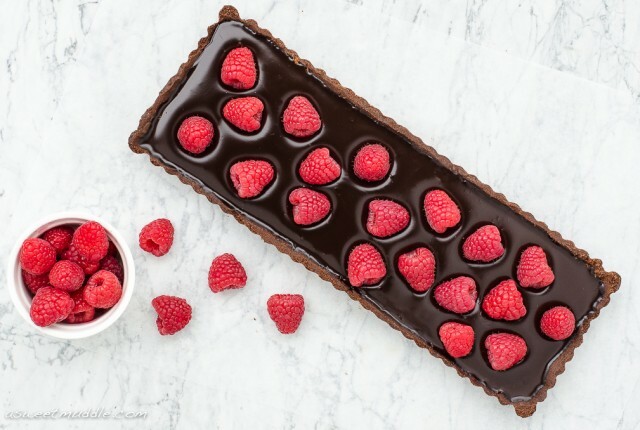 Seal the jar and store in the fridge for at least 24 hours before serving. I found this recipe nicely filled a 200 ml Wreck jar. If you prefer your pickles a little sweeter, add another teaspoon or two of caster sugar. Don’t be alarmed if you check on your pickles and discover they’ve changed colour. They will gradually turn a vivid pinky orange colour as they rest. They should last in the fridge for about a week. I had an overabundance of radishes from my CSA this year. This is the perfect way to use them and I will be keeping that in mind for sure! 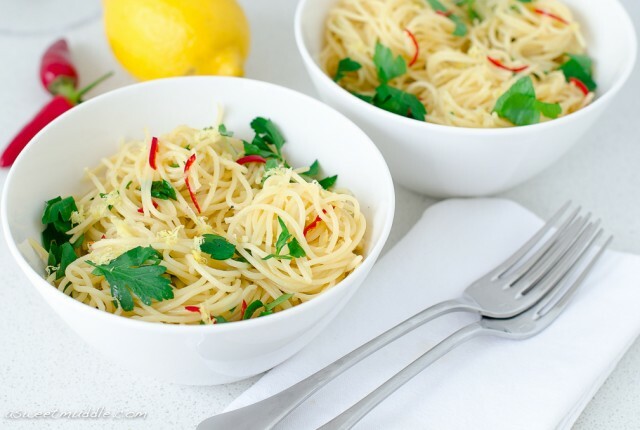 My boyfriend loves radishes Rachel so this recipe is perfect for him! I shall be trying this when they come into season, pinned!